Words Are Weapons: Inside ISIS's Rhetoric of Terror. By Philippe-Joseph Salazar. New Haven: Yale University Press, 2017. 256 pp. $30. Salazar, French philosopher and professor in rhetoric at the University of Cape Town, argues that the West does not understand the rhetorical power wielded by the Islamic State (ISIS), or "the Caliphate" as he calls it. He argues that the "desire to treat terrorism as an exception to normal politics" led analysts to perceive it under the influence of medical, managerial, criminological, and other incongruent discourses. Instead, one needs to recognize the caliphate as a military force with endless, radical hostility. Some of his solutions are good; others debatable; many are completely indecipherable. Salazar states: "We have become linguistically impotent," and language needs to reflect the war the West is waging. He rightly rejects the "lone wolf" trope (he prefers "guerilla" or "henchmen") and the "radicalization" narrative to explain why formerly moderate Muslims suddenly join ISIS (he prefers "conversion"). Less convincingly, he urges the reader to "accept that 'terrorists' are militants, soldiers, combatants, not unlike Dutch, French, Belgian, Polish guerillas who were called 'terrorists' by Germans." Some of his linguistic revisionism is strained. He goes to great lengths to establish the difference between "throat slitting" and "beheading": ISIS does the former whereas French revolutionaries did the latter. To the French ear, Salazar contends, the term décapitation "amounts to saying that the Islamic henchmen are on the side of justice, in the same manner that the French revolutionaries were while those who were 'decapitated' were on the side of evil." But his discussion would have been more fruitful had it focused instead on ISIS rhetoric and Qur'anic passages urging Muslims to "strike at the neck" of the infidels. wing European lens, with quotes from Jean Paul Sartre, Carl Schmitt, Jacques Lacan, and Michel Foucault, and imitations of Roland Barthes and Jacques Derrida. 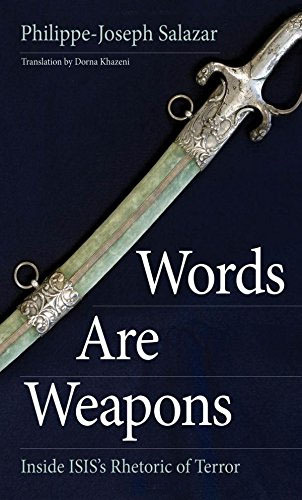 Rather than discuss Islamist rhetoric that justifies offensive jihad as defensive, Salazar prattles on about the "telluric character of the passage from defensiveness to absolute aggression." Instead of explaining Dar al-Islam (the realm of submission) vs. Dar al-Harb (the realm of war), he offers European concepts of community. Instead of explaining the meaning of takfir (declaring Muslims apostates), he deconstructs the concepts of exclusion and populism. The results are baffling. It is hard to imagine an audience for this book.